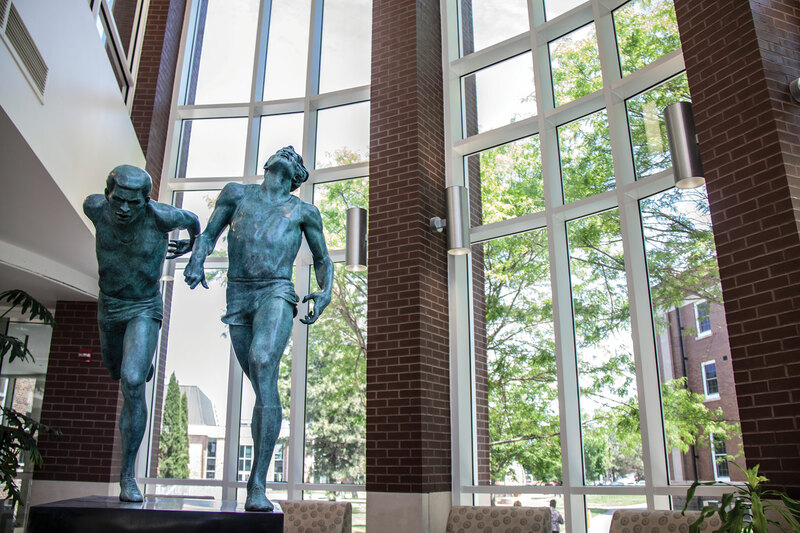 This summer, "The Finish," a sculpture created by artist A. Thomas Schomberg '64, was added to the front entrance of the library. Library renovations are nearly complete, while a new technology center and press box replacement are planned. “The Finish,” a sculpture created by artist A. Thomas Schomberg ‘64, was added this summer. Schomberg obtained his bachelor of fine arts in education at Wayne State. U.S. Conn Library renovation is on schedule to be completed in summer 2017. Wayne State College recently secured $6.6 million through a state bond program underscoring the importance of a $15.2-million state-of-the-art Center for Applied Technology to address workforce and economic development in Nebraska. Wayne State College’s School of Business and Technology has a strong reputation of graduating well-prepared students who serve as industrial technology educators and leaders. The Center for Applied Technology will continue to attract first-rate students and faculty and increase the number of industrial technology teachers, diversified manufacturing administrators, construction and safety managers, drafters and computer programmers. The Center for Applied Technology will also provide northeast Nebraska with a facility to support management training for industry, encourage ongoing employee development, foster small business entrepreneurs interested in manufacturing and engage in applied research with industry. The Center for Applied Technology will be built directly east of Gardner Hall. The existing press box has served the college for approximately 40 years. There are concerns about the structural integrity of the structure, life safety concerns, building code deficiencies, handicap inaccessibility and poor function for college events. The current press box is not structurally stable enough to stand up to the high wind loads present in that portion of campus. Problems with the roof have been continuous because of wind loads and due to the lack of a rigid structure to support the roofing system. The project will include the demolition of the existing structure and the construction of a new 5,220 square foot press box, including an elevator tower that will be built on the northwest side of Memorial Stadium. The new press box and elevator tower addition will provide space for all of the existing functions of the press box while increasing the size of several spaces to meet current and future needs. The press box is used by members of the press, coaches, officials and college students involved in Broadcasting, and Health, Human Performance and Sport degree programs. The press box serves as an important laboratory for these students as they prepare for careers in broadcasting, journalism and athletics. The plan for the press box was developed with a vision that considers use by staff, students and alumni during collegiate and community events. Stadium and press box facilities are often used by local school districts for football and track events, which played an important role in the planning process for the new facility.